For summer wedding guests who find themselves attending a nuptial celebration near this week's patriotic holiday, the fourth of july. 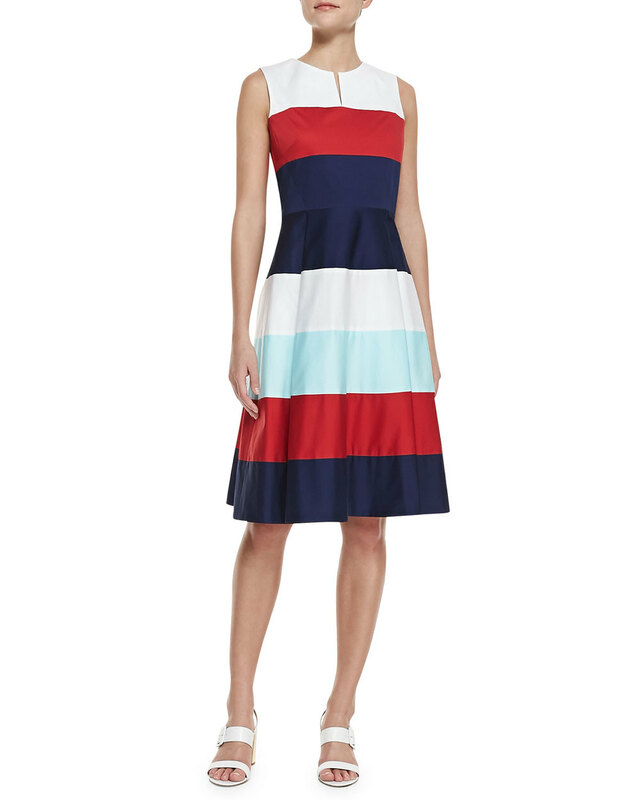 Dresses in gorgeous deep berry shades, nautical navy, and summery stripes. One world of caution - let's leave the white to the bride! Check out this month's Arizona Foothills Magazine article, where I cover the historical traditions & today's trends of "The Bridesmaid Army"
Assemble the chiffon maxi wearing, lip gloss packin, life-saving troops! When long time friends Pam Keough and Pam Hardy decided to evolve their corporate event planning backgrounds into careers in wedding planning, neither realized the path to quick success they had started. Almond Tree Weddings, a bridal boutique with a focus on consigned gowns, has grown from humble beginnings in a spare home office to a multi salon retail space in City North. Hardy and Keough always dreamed of operating a business together. As their experience in the wedding planning industry continued to build, it became clear that a retail element was the best way to enhance their presence in the industry, and create a sustainable income. An idea came about to focus on the core of the bridal experience – the wedding dress. Most gowns are worn between 6-8 hours during its entire existence, leaving it in close to pristine condition after the event has come to an end. Hardy and Keough wanted to create a way for newly married brides to offer their single use gowns for money back, giving newly engaged wives-to-be the opportunity to have access to gorgeous gowns at a lower cost, still in like-new conditions. Hardy and Keough realized the great opportunity they had , as few businesses had taken the route of reselling gowns. Their success began with the consignment of five gowns, which were bought and resold out of one of Keough’s spare bedrooms. As their business idea began to take shape, the recession hit, providing a remarkable chain of events that helped skyrocket Almond Tree’s success to where it is at today. As many small businesses around the country were closing their doors, bridal boutiques were needing to liquidate stock, including samples and brand new gowns, to avoid taking the auction price. Almond Tree’s back stock grew from five to more than 500 dresses, outgrowing their home office, then a storage unit, then an enhanced storage unit with storefront – all in a matter of months. Today, Hardy, Keough, and third business partner Gina Kilter, operate a boutique in Phoenix that offers private “living room” style salons for brides and their friends and family to enjoy the intimate process of finding the dress for her big day. Upon arrival, Hardy makes sure to ask new brides to share all of the details of their wedding, then to share their favorite fashion icons. She is confident that she’s able to select the best gowns for each woman based on these details, finding pride in challenging brides to try on styles they may not be open to. More often than not, Hardy says the brides select a gown they would have never pulled off the rack to begin with. She believes a dress needs to be experienced intellectually, then emotionally, as it is more than another beautiful piece of clothing. Picking out a wedding dress is more about selecting the person you want to be on your wedding day, as a bride, and that moment of complete emotional connection to the garment is how you know you’ve found the one. With the overwhelming popularity on social media sites, Pinterest and wedding blogs, Hardy confidently points out the “it” trend of the season – vintage, or modern vintage. This is a bride who loves lace, who prefers a bit more coverage with a cap sleeve or back detail, a romantic Hollywood vibe from the 50s and 60s. The look can be taken in the direction of a subtle burlap, mason jar & daisy bouquet wedding, or made more contemporary with a barn venue, crystal detailing, full table settings in a dimly lit atmosphere. It’s a trend the ladies love, and will continue on into the spring wedding season. Visit Almond Tree Weddings at 5310 E. High street, Suite 105 in Phoenix.